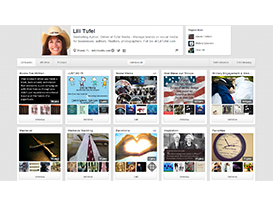 Tufel Media can help your brand stand out on Pinterest. We make sure your profile, boards and pins are all categorized properly. If you alreadycreated a personal account, Pinterest gives you the opportunity to convert your personal profile into a business account. You also have the option of joining as a business and keeping your personal account for personal use. There is a big difference between using Pinterest as a consumer and using Pinterest as a business. If you’re constantly re-pinning other people’s pins, you’re using Pinterest as a consumer, not as a business! Having an optimized profile on Pinterest helps people discover your business and share it with others. Your business profile should be categorized properly. It should have the right brand image as the profile picture and your business name as your username. The about section should be clear and concise. You should be using keywords that help your profile appear in people’s searches. And most importantly, you should be pinning valuable visual content! Pinterest offers tools to businesses that are not available to personal accounts. Business accounts have access to Pinterest web analytics. Many businesses don’t check their metrics. We help you stay ahead of your competition by regularly checking your metrics and analytics. Pinterest analytics show you how many people are pinning from your website, seeing your pins, and clicking your content. It is important to know which pins get the most repins and the most user engagement. We use this information to tailor your website and your Pinterest boards.